This page contains links to the slides and code from my talk “Understanding parser combinators”. Traditionally, writing parsers has been hard, involving arcane tools like Lex and Yacc. An alternative approach is to write a parser in your favourite programming language, using a “parser combinator” library and concepts no more complicated than regular expressions. In this talk, we’ll do a deep dive into parser combinators. We’ll build a parser combinator library from scratch in F# using functional programming techniques, and then use it to implement a full featured JSON parser. 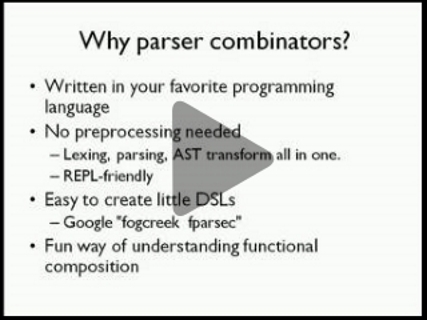 Understanding parser combinators from my slides on Slideshare.